For the last three years I have been an Accordance (Bible Software) user. I use Accordance for all of my original language study and profit immensely from having such a powerful set of tools (most of which I have barely scratched the surface of) at my disposal. I also use it for reading commentaries alongside of my Scripture readings — and find these modules very easy to use together. However, I also have some other things in Accordance that don’t work too well with the format. I have Calvin’s Institutes, The Works of Jonathan Edwards (2 Vol. ), the writings of John Milton, St. Thomas’ Summa, and other miscellaneous works of theology. Accordance shows its strength both in its speed and when dealing with original language material, but it shows a massive area of weakness when it comes to handling or searching anything that isn’t Biblical material or commentaries. Simply put, in my opinion, Accordance just wasn’t made for reading most books. It's hard to search them, it's hard to navigate them, and it's hard to even open them to read them in the first place. I'm sure there is probably a way to bookmark my place in them, but I've never figured it out. This is where Logos comes in. Logos is Bible software that’s been around for a long time, but with the release of the Reformed starter packages they have begun receiving some extra attention from Reformed bloggers like myself. I was recently given access to the Reformed Gold package by Logos with no conditions attached. That means that I don’t necessarily have to write anything nice if I don’t have anything nice to say. What I’m trying to say is that I don’t intend this to be an informercial. Instead, I want to offer some thoughts that may help you to decide if you should buy Logos — and especially the Logos Reformed Gold package. Most of the students here in Seminary seem resigned to the fact that no matter how much they love paper books, or may bewilderingly associate electronic books with Gnosticism, they will probably need to get some kind of software to digitize their Bible study and reading. The question for most is if they need to commit to one particular format, and if so, which one? I won't give a firm answer to that question, but I hopefully have some helpful thoughts on the matter. After spending a couple years with Accordance and the last six months or so using Logos, I do want to mention the four advantages of Logos as I see them. First, Logos is the best for an all around library. I mentioned already that Accordance is a very weak format for reading anything that isn’t the Bible. Do not buy Accordance because you want a nice, portable version of Augustine’s Civitatem Dei that you can pick up, put down, and come back to later. The format (even in the portable iPad version) just does not work well for such books, nor does it have actual page numbers, making citation of books in Accordance, if not impossible, at least a huge pain in the neck. This leads to my second point, which is that in contrast to Accordance, Logos gives you actual physical page numbers. This means that you don’t have to dig around for a new, funky 21st century citation style involving location numbers or anything like that. You just cite the page number of the particular edition you are reading in Logos. It’s all very nice. Also on that point, copying and pasting from Logos into a document you're working on automatically comes with the page citation in whatever format you set up (except for Pages, which evidently doesn’t like pasting citations). That’s very nice, and something that makes research papers that much less painful. Third, searching within books in Logos is extraordinary. I have tried to do book searches in Accordance and have yet to figure out exactly how it works. As I’ve mentioned, the format just isn’t friendly to that kind of study. Maybe there are ways to do it in Accordance that I have yet to discover, but at this point I don’t do it. 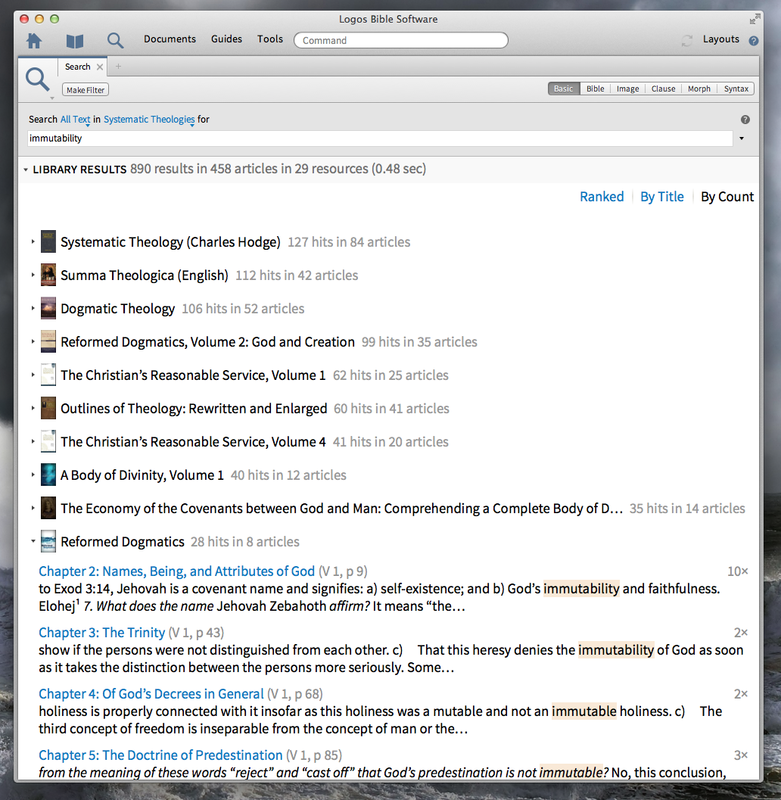 In contrast, once Logos has had a chance to compile its search library (which can admittedly take some time after each update, depending on the size of your library), it is very easy to search for scripture citations or references within all of your books and commentaries. Coupling this with the ability to group your books into “Collections” which you organize according to your own tastes, those with larger libraries can choose to only search for a particular reference in their Systematic Theology books or in their Biblical Theology books or in their Commentaries, making your searches as focused as you want. Learning to do collections isn’t easy, and involves digging around through web forums over at Logos, but once you’ve done it you will be glad you did. Fourth, Logos has a really well-made iOS app. One of my classes for the Fall at RTS has us reading Andreas Kostenberger’s book A Theology of John’s Gospel and Letters. I thought about buying a used physical copy from Amazon but instead bought it for Logos at full price. Why did I do this? Well, frankly it’s a large book. It is a book I will be reading all semester long. I don’t like lugging around big books. I look forward to being able to go to school and conceivably sit down and just open my iPad Mini to get a bit of my school reading done. No pressure, just wherever I find myself to sit down and get in some reading. The iOS Logos app is the reason this is possible, and I like it a lot. Unlike the desktop version, which has a long startup time (hint: just never close it and leave it running in the background and then you won’t notice), the iOS version on my iPad Mini is snappy, fast, and involves almost no waiting. You can read your books without downloading them, just reading them in the cloud over Wi-Fi or you can download them to read later when you’re out in the boonies. However you use it, the iOS app is very good, minimally glitchy, and makes for a great reading experience. The desktop app is great for searching and studying, but the iOS app means that you almost feel you can sit down and enjoy the book as a book, not just dig through it for quotes or information. The weakness of Logos is related to its strengths. It's great at searching what can be an incredibly large library of material, but that takes computing power and time. As such Logos, when it first starts up, can take several minutes if it hasn't been updated recently. Also, the original language modules in Logos, from my perspective, have a steeper learning curve than they do on Accordance. My final complaint, once again, relates to the size of the library in that looking for books is not intuitive. You have to know the name of the author to search for it, or you have to have used it recently and have your library set to show most recently used first. These aren't deal-breakers by any means, but they do mean that you will have to be purposeful in how you use the software. Perhaps a seminary student may have a friendly benefactor who wants to bless them with some Bible software and gives them a choice. If someone finds themselves in such a situation, which should they pick? Well my answer is that it depends on what they’re going to do and where their interests are. If you are into history and commentaries or systematics but aren’t much of a language guy, I actually think Logos is the best pick. But if you’re into the languages exclusively and don’t see yourself building much of a digital library I still might recommend Accordance (with a few language-specific modules) over Logos. I will actually mention how I use my own Logos/Accordance set up, which is a bit of a hybrid. I use Accordance for my Bible study and language study. It’s fast and easy to use without a lot of bells and whistles (unless you want them). But I absolutely use Logos alongside of Accordance. The two are not enemies on my computer. I play to each of their strengths in the way that I use them. I keep a window open with my Bible study stuff from Accordance — and I keep another window open where I look through the many commentaries and systematic theologies that come with the Reformed Gold package. I see them as complementary. Speaking specifically of The Reformed Gold package, it comes with so many books that it can almost be overwhelming. It comes with some really fantastic things such as Bavinck’s Reformed Dogmatics, the Lewis Ford Battles translation of Calvin’s Institutes, as well as the complete works of John Owen, Louis Berkhof, John Bunyan, B.B. Warfield, and Richard Sibbes. It also comes with some extraneous stuff that I’ve never heard of but that I plan to explore when I find the time. Some of the material is a bit dated. For example, Kittels was a very impressive resource for a long time, but with the work of James Barr (see his book The Semantics of Biblical Language), it is now evident to modern students of Greek of the New Testament that the methodology employed in Kittel’s 10 volume Theological Dictionary of the New Testament is fundamentally flawed. It’s a valuable resource and still has value, for sure, but it’s also hardly cutting edge any longer. I can’t tell somebody what would be best for them, but I can hopefully at least give somebody an outline as to how to approach things. If someone is interested in the Reformed Gold package (or any of the packages for that matter), I would begin by going to Logos’ website and installing the free base app on their computer. Grab some of the free modules from their web page and start there. See if you like the program and how it runs. Try out the search functions for yourself. Fiddle around with the iOS app, which I do think will impress most who try it out. If you have the money and are looking to have a nice searchable library that you can take anywhere with you, Logos is a really strong choice that deserves serious consideration. [Update (8/27/14)]: I would highly recommend reading the comments below by R. Mansfield, who is an employee of Accordance. He has corrected me on many of my statements regarding what Accordance can and cannot do. We would do well to remind readers that this perspective offered above is of an average user who has not taken any classes on either platform. My perspective here reflects my own "non-expert" experience with both, and so should be read in light of that. Adam, like you, I have significant personal investments in both Logos and Accordance Bible software. Unlike you, I happen to work for Accordance (OakTree Software), so I feel it’s important to respond to your post. I’ll be up front—I find your comments about the supposed deficiencies in Accordance’s non-biblical texts to be (mostly) exaggerations at best and downright incorrect and misrepresentations of the software at worst. I’m glad that you were able to get free software from Logos for review. However, I believe you could have given it a thorough review without having to mischaracterize a competing platform. You state that Accordance titles do not have page numbers. This is simply not true. A quick aside for some contextual background... In the early days of Bible software, most companies first produced English Bible translations, which had versification, so page numbers were not necessary. Gradually, Bible software companies began adding support titles such as lexicons. Again, page numbers weren’t included because many citation methods don’t require page numbers for dictionaries and lexical works since the entries are listed alphabetically. Then Bible software companies gradually begin adding other non-biblical titles. The first such offerings were usually public domain titles that had been transcribed into electronic form and did not contain page numbers. Let me give you an example of what I’m talking about. One of the first non-biblical electronic texts most Bible software publishers released was a public domain edition of Calvin’s Institutes by Henry Beveridge. It is true that the Accordance edition of Henry Beveridge’s translation of Calvin’s Institutes does not have page numbers. But guess what? There are no page numbers in the Logos edition either. Someone at Logos or Accordance could refer to a print edition of Beveridge’s work and insert the page numbers into the digital text, but honestly, there’s just not enough demand to justify the cost and expense for someone to do this. Just type the text you want to search, select the kind of search you want to perform from the drop-down list, and you see your results. Easy-breezy. Moreover, just as you can create Collections in Logos to search through multiple titles all at one time, you can create “Groups” in Accordance that perform the same function. Back in June, I wrote a blog post that described creating a group out of illustration resources (see http://www.accordancebible.com/Tip-Search-All-Your-Illustration-Books ). Note that this can be done with any titles you want. You said this is easy to do in Logos. Well, it’s easy to do in Accordance, too! Create your groups for theologies, lexicons, whatever you want. Now, note that in everything I’ve written above, I’ve said NOTHING negative about Logos. I guess that’s what frustrates me about your review. It would be one thing to write about the benefits of Logos’ Reformed Gold package and let it stand on its own merits, but it’s something else entirely to write your review in such a way that tears down Accordance with information about the program that is simply not true. Having used both programs for a number of years, I can tell you that both are complex, and both have a bit of a learning curve (this is true for any professional software platform). But you complained in your review of Logos that there were certain things you did not know how to do in Accordance. Did you consult Accordance’s incredibly extensive built-in help system? Did you contact Tech Support? Did you post a question in the Accordance user forums? Did you take part in a free training seminar or webinar? When you found a feature you thought was missing, did you bother to request it in a future update? Rather than live in frustration, reach out a little. There’s lots of help out there, and you may discover that a program like Accordance is actually a lot more powerful than you realize. I, along with my readers, will benefit from the points you have made here. I do not pretend to be an expert at either of these software platforms. Rather, I consider myself to be representative of those who are average computer users who love God's Word, love books, and want to know the best way to use them to his glory. I have never taken classes on either platform, nor have I spent years working for either company, perfecting my knowledge of the platforms. Many of those considering using these platforms are not experts at them and never will be. I am glad to receive your corrections on these many points and will make sure to point my readers to your comments. As a final thought, it seems from your comments that you perceive me to be down on Accordance. 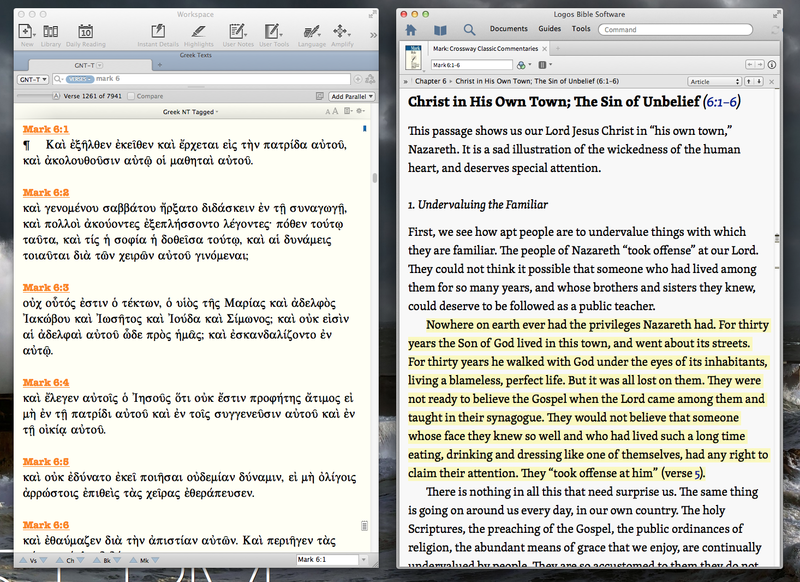 Let me just be clear that Accordance is my preferred Bible software, and I still use it way more than I use Logos. I use it on a daily basis. It is my software for sermon prep, for reading in the original languages, for daily Bible reading, and serious study. It is what I read to my children from at bedtime. I love Accordance. Also, I want to mention that I have no doubt that those who work for Logos who know their software in and out will probably roll their eyes at the way I write off the platform's ability to do original language work. More than likely due to the complexities of these platforms I still have lots and lots to learn. Adam, thanks for your response. I was concerned after I posted my comments that I may have come across as too harsh. As you know, tone and voice are not as easily communicated in these kinds of venues. Regardless, let me offer you an invitation to one-on-one help with some of the aspects of Accordance for which you're unfamiliar. I'd be glad to help you where I can if you have time for it sometime soon. Fearing the God Who Rescues?